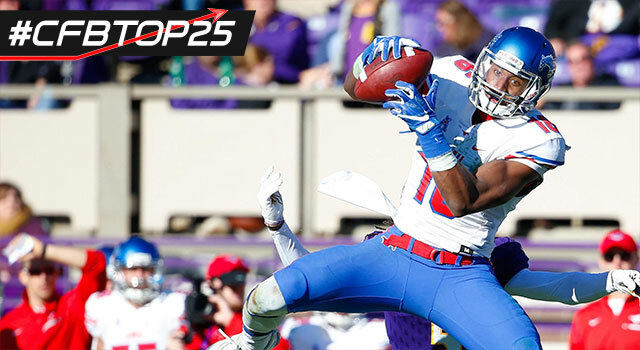 With Courtland Sutton in tow, SMU might be home to the best wide receiver in college football. At 6-foot-4, 218 pounds (school measurements), Sutton is big, tough and confident. He makes his debut in the #CFBTop25 countdown after racking up 76 catches for 1,246 yards and 10 touchdowns last season. The junior has been likened to Buccaneers Pro Bowl WR Mike Evans by NFL.com analyst Daniel Jeremiah. Sutton needs to tighten up his route running and it might take him some time to adjust once he gets into a pro-style offense, but his upside is undeniable. Sutton received votes from six of seven CFB 24/7 experts, including one top-12 vote. Four of the six votes he received fell in the Nos. 22-24 range of the rankings. Two wide receivers are ahead of him in the #CFBTop25 countdown, but NFL.com analyst Lance Zierlein ranks him the No. 1 player at the position to watch heading into 2017. Where do fans rank Sutton? We asked Twitter users who they considered the best player in college football. Sutton didn't receive a vote. It's not surprising that fans might not be familiar with Sutton, as he plays for a program that doesn't get much national attention. He's firmly on the radar for NFL scouts, though.